refined carbohydrates of any kind like breads, etc. Now I think there are two key things to take away from this short and sweat post..
You need to stop calling inflammation and other ailments “old age” and “heredity” (your genes) – none of this was designed into either. Your body was built to function for longer periods than you think and if you label things incorrectly like this, then you don’t take steps to do something about it. You need to start realizing that food is medicine and is the most highly influential substance that we can put into our body. Wrong foods create wrong results and right foods create much better results. Long term inflammation deteriorates our organs and body systems until whatever the weakest link is gives out. We go to the doctor and he or she treated the symptoms but not the root cause of the problem. And after years of living with inflammation, the damage is done because we didn’t recognize at the time that this inflammation was not something we could allow to continue. A doctor of functional medicine treats the cause, not the symptoms. I’ve provided some links and some self-tests for food tolerance elsewhere in this website. To find out more about Dr. Peter Osborne, click here. Pain today or more pain tomorrow? Here’s a short presentation by Dr. Osborne that we don’t consider in our normal course of dealing with pain. For further reading go here. For those of you who do not know what Functional Medicine or a Functional Medicine Doctor is, here is a message from the Chairman of the Institute for Functional Medicine that might help explain. I believe you need to know about this growing discipline that treats causes not symptoms. If you want to get help finding functional medicine doctors, functional medicine practitioners, or sometimes called integrative medicine doctors, please visit this link. I you’d like to learn the science behind Gluen intolerance and sensitivity, this is a great presentation. Dr. Lustig has done some important work to educate us on why obesity is a disease and not a lifestyle choice or poor judgement or poor discipline. I think that anyone facing obesity, diabetes or metabolic syndrome should review his work – he has a book Fat Chance, and was featured in the movie Fed Up. I believe he does a very good job of putting obesity in perspective and providing the information we need to reverse obesity and avoid progression to diabetes naturally. This is an excellent interview with Dr. Lustig. And as you would suspect, it is more about what you eliminate from your diet than what you add or what drugs you take. Scientists and doctors sometimes refer to your intestinal track as “your gut” and it generally refers to all of the bacteria and micro-organisms residing in your colon, your lower intestines, and youstomach. These are really the bacteria that digest your food into molecules small enough to become nutrients for your blood and hormones for your body. Recent discoveries have shed more light on the Gut or more scientifically the Micro-Biome. It appears that perhaps 70% of your immune system resides in your Gut. And the hormones that activate your pancreas, liver, and more are produced in your Gut. And therefore it would appear that what you eat has everything to do with the signals (hormones) you send to your other organs – you heart, pancreas, brain, liver, and more. One such signal or “pathway” is when you feed your gut a whole lot of sugar (fruit, bread – yes, baked goods turn to sugar in your blood faster than sugar, soda pop, etc.) – more than it needs or can use. Once it begins work on digesting that, it can’t handle it all and it moves it into your blood stream causing your pancreas to send out insulin in order to dispose of it. The body definitely needs to get sugar or glucose out of your bloodstream because the longer it remains there the more damage it does to the walls of your blood vessels and that in turns puts out the call for more cholesterol – the body’s repair mechanism for damaged blood vessels. If you’re running a marathon insulin brings glucose to the muscles where it is burned for energy. If you are sitting in front of the TV or your desk, the muscles don’t need it so it begins to deposit it into your fat cells. Of course the real “science” behind these discoveries is saying that the next level down is that what you eat activates your genes and depending on what you eat will determine how your body reacts to the genes that activated – we generally think that diseases like obesity or diabetes are passed on through the genes but the scientists would argue that we all have the same genes to start with and which one expresses their characteristics is a matter of our habitual diets and of course our environment. As an example, eat more good fats in your diet and your genes will express the right hormones to encourage neurogenesis, the creation of new brain cells to replace the old ones. Eat the wrong foods, high in carbohydrates like sugar, grains, pasta, etc. and you discourage neurogenesis. And hello Dementia and Alzheimers. The most important takeaway for this article is that “food is medicine” and we need to start thinking about what we eat as the key to healing ourselves and preventing many of the diseases we could suffer in the future. Here is the book I love for the more thorough explanation of how this works. I happened to think that there are those who are so resigned to being type 2 diabetic that you wouldn’t attend the free summit or even read long articles about how to reverse type 2 diabetes. We certainly don’t recommend that you take yourself off your medications and we don’t recommend that you do anything without speaking to your doctor. 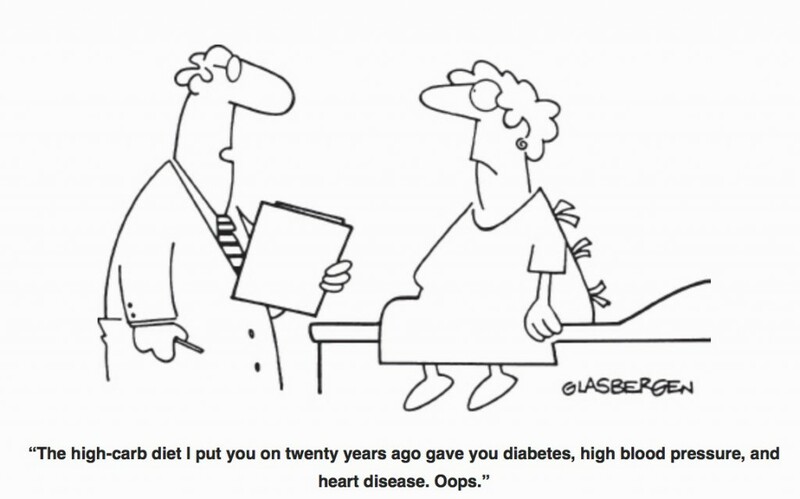 And perhaps you are pre-diabetic and still have some time. You have all the classic symptoms but you’re just ignoring it hoping it will go away. Here is a simple test you can do that won’t really hurt you at all. It involves temporarily switching your diet from sugar to fat. Stop eating grains, breads, pastries, rolls, rice, potatoes, and anything made from these products as best you can. Stop eating sugar, fruit, or anything sweetened and labelled “low fat” or “low calorie” with high fructose corn syrup or other sweeteners you can’t pronounce. Stop drinking sodas or fruit juice. Instead eat more meat, fish, chicken, and eat avocados and nuts, and salad with plenty of olive oil and steamed vegetables with a little olive oil on them as well. And then just see what happens. These are relatively small changes. And you can do this for 2-3 weeks without starving or killing yourself. You can eat as much of the other things as you want. No counting calories, no worrying about portions. Just see how you feel. If you feel better, then you’ve learned something. If you don’t, then no harm. It’s a simple request. And we’re making this request because we love you. Your family and friends – they love you and they’re asking you to try this. “You stumble to the bathroom in the morning, and as your eyes adjust you notice a cluster of pimples on your face. Ugh. As the day drags on, you can’t shake your sleepiness, your appetite is insatiable even though you’ve been popping potato chips, and you just feel crummy. It might just be a bad day…or it might be a more sinister health issue. Why We Get Fat – A Book Review – Have You Asked Why Am I Not Losing Weight? “ 1. Why Were They Fat? Excerpt From: Gary Taubes. “Why We Get Fat: And What to Do About It.” iBooks. For people who ask, “Why am I not losing weight?” and you’ve tried everything, you should read this book and discover that it’s not your fault, and once you understand obesity you can also understand how to finally fight the true cause.